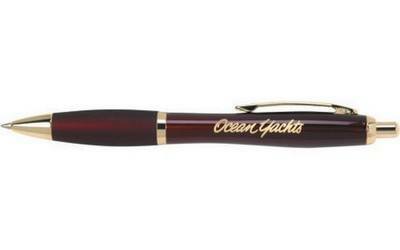 The Santorini retractable ballpoint pen features an elegant color design and comfort grip barrel for writing ease. 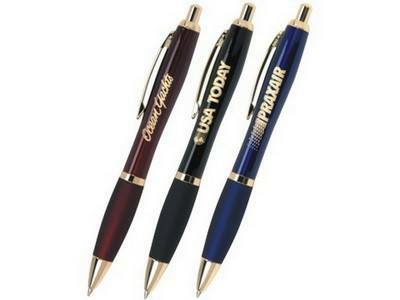 Features a distinctive hourglass shape, enamel finish, colorful reflective grip, and a smooth-writing ink cartridge. 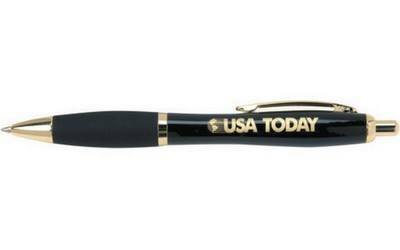 Boost your brand with this curvaceous beauty! Constructed of metal, the click-action Santorini ballpoint pen features a distinctive hourglass shape, enamel finish, colorful reflective grip, and a smooth-writing ink cartridge. A one color/one location gold engraved imprint will catch the eye of all users! Designed and manufactured to your complete satisfaction and comes with a lifetime guarantee on mechanical parts. Excludes consumable parts such as lead, refills, and erasers. Click on the location(s) where you want your laser engraved logo to appear.